How Do You Control Aphids on Indoor House Plants? Aphids are tiny sucking insects from the insect family Aphididae. The group includes roughly 5,000 different species, with several hundred that may be a problem for agriculture and gardening. Adult aphids are pear-shaped, measuring less than 1/8 inch in length. The most common aphids on houseplants are the light green ones (pear aphids), but aphids can also be found colored pink, white, grey and black. Additionally, winged aphids can appear when colonies are established and fly to infect new plants. Juvenile aphids (nymphs) look like smaller versions of the adults. Aphid infestations tend to develop quickly, and the insects are highly mobile: they rapidly travel from one plant to another. In the outdoor garden, aphid colonies are often tended by ants, which feed on aphid honeydew— a sugary liquid that is secreted by aphids as they feed on sap. Researchers have observed ants transporting aphids to new plants and hypothesize that these ants are "farming" aphids in order to feed on the honeydew. Indoors, aphids spread between plants by flying or crawling. Aphids cause damage by sucking sap from new growth on plants. They tend to cluster at the growth end of plants and attach themselves to the soft, green stems. As a result, the new foliage may look crinkled or stunted, with the aphids usually plainly visible around the stem. If the infestation is bad enough, the plant will begin to drop leaves. Finally, like mealy bugs, the honeydew secreted by aphids can encourage the growth of sooty mold and fungus. Outside, aphid eggs survive the winter by attaching to woody growth. In the spring, the eggs hatch into females. The females give birth to nymphs without mating, and these nymphs rapidly mature into adults (in about 10 days). Males are born in the fall and begin to mate with the females to produce eggs in preparation for the long winter. Indoors, however, there is no winter to slow their reproduction, and female aphids can continue to produce nymphs all year without pause. Thus, the aphid population can quickly get out of control on indoor plants. 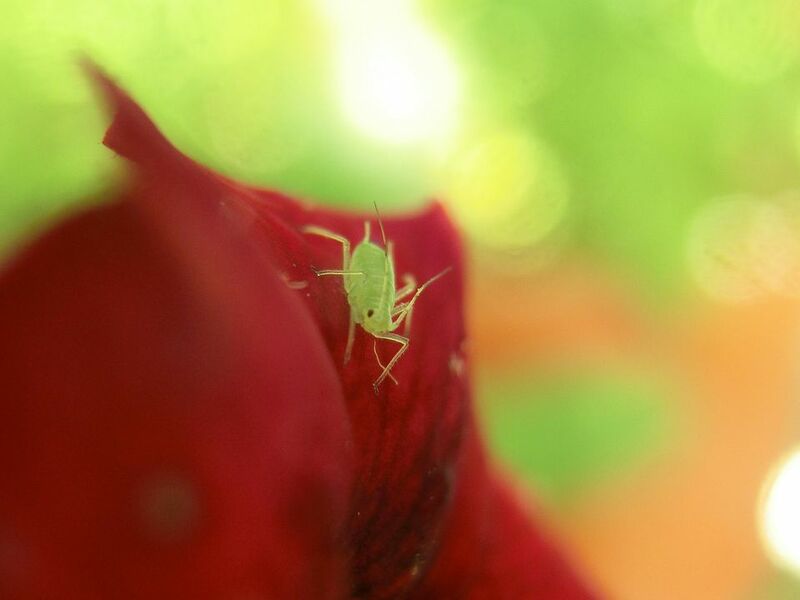 Like most pests, the best control for aphids is defensive. Healthy, vigorous plants are less susceptible to infestation than weak, underpotted, and stressed plants. As a general rule, if make sure your plants are healthy, you're less likely to attract these annoying critters in the first place. If you see aphids on your indoor plants, there are many control options, most of them non-chemical. Wash them away. Use a strong stream of water to blast aphids from your plants. You can also knock them off with your fingers or a cotton swab. This is best for light infestations. Dip in water. If the plant has delicate foliage that won't tolerate spraying, you can dip the entire plant in water to dislodge the aphids. Turn the plant upside down and dip the foliage portion into a bucket of clean room-temperature water. Use insecticidal soap. Insecticidal soaps are available on the market (such as Safer's Insecticidal Soap), or you can make your own by using a dish detergent such as Ivory Liquid. Try to find a product free of perfumes and additives that might harm plants. Mix the soap in a weak concentration with water (starting with 1 teaspoon per gallon and increasing as necessary). Spray on plants, focusing on the undersides of the leaves. Apply neem oil. Neem oil is derived from the neem tree and thus is entirely organic. Use according to label instructions. In addition to its insecticidal properties, neem is also a fungicide and has systemic benefits (meaning the plant absorbs it so it can control insects it doesn't directly contact). According to the Environmental Protection Association, neem is safe for use on vegetables and food plants as well as ornamentals. Use a homemade insect spray. This all-purpose insect spray was developed by the editors of Organic Gardening magazine and has been described in Rodale's Organic Gardener's Handbook of Natural Insect and Disease Control. To make a batch, combine 1 garlic bulb, 1 small onion, and 1 teaspoon of cayenne pepper in a food processor or blender and process into a paste. Mix into 1 quart of water and steep for 1 hour. Strain through a cheesecloth and add 1 tablespoon of liquid dish soap. Mix well. The mixture can be stored for up to one week in the refrigerator. Apply rubbing alcohol. Though this method is a little time-consuming, aphids will be killed if you coat them with a swab dipped in rubbing alcohol. Removed damaged plant part. You can cut away sections of the plant that are heavily infested and dispose of them outdoors. Hang sticky traps. Sheets or strips of sticky paper hung around your plants will trap any insects that come to visit. Sticky traps are available at garden centers and from online retailers. Use chemical spray. It is always best to avoid chemical solutions when you can, but if a severe infestation of a prized plant leaves you no option, treat the infestations with a spray that contains pyrethrins, imidacloprid, or pyrethroids. Of these, pyrethrin-based sprays are the safest, since they have a low toxicity and don't persist for very long.